While most tourists go to Gran Canaria for the sun and heat, not everywhere is subtropical. 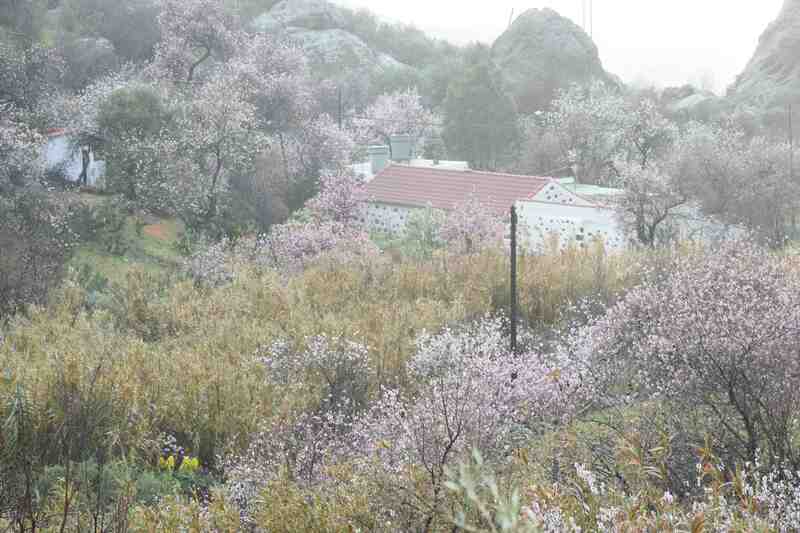 Go inland, away from the tourist areas, and up the mountains and you enter a very different world. 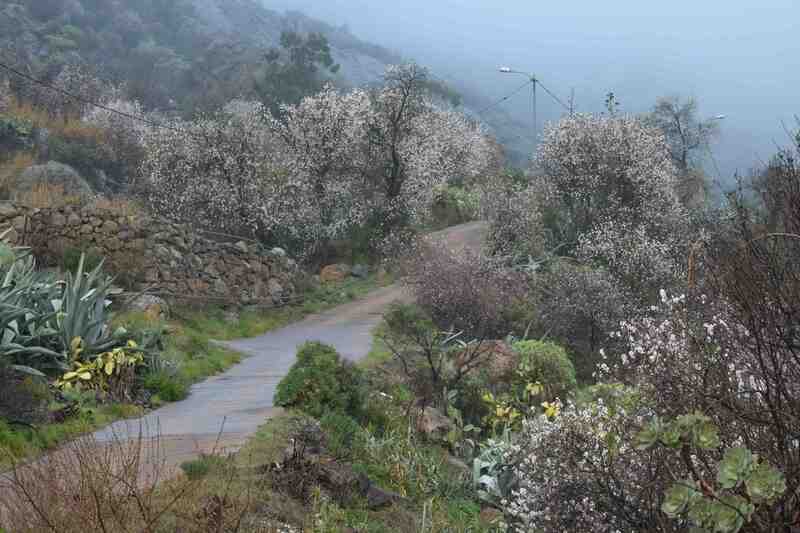 This is one of the wonderful features of the Canaries – you can have four seasons in one day. And if you think the weather is changeable in Ireland you will be perfectly at home here where, as you pass from one barranco to another, you can leave the sun behind and be in shadow or even drive into a low cloud. 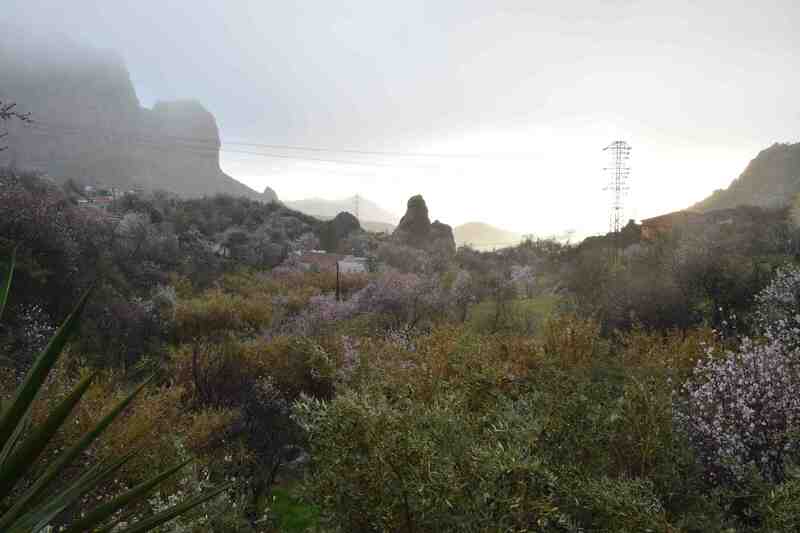 So on a drive up the western side of the island, in the Parque Rural del Nublo, most famous for the prominent Roque Nublo that stands at 1769m we came from sun into drizzle as the clouds descended on us as we drove through Tejeda, standing at about 1000m. This small village, perched high in the barranco, facing west towards the sea consists of a sharp bend in the hill-hugging road with a dozen or so houses and a restaurant. I doubt that it is much visited by tourists but it is a lovely spot, even in the rain towards sunset when you need to get back to the hotel! The vegetation here is so different to the coast. 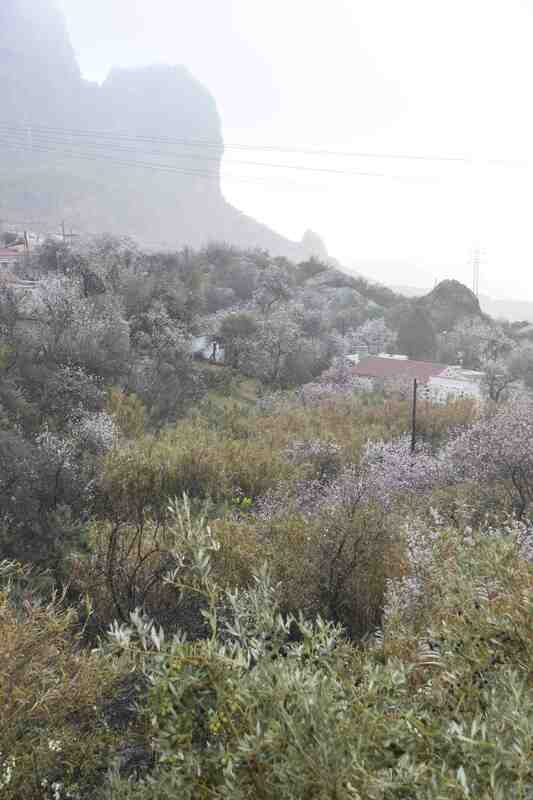 Although probably frost-free, I assume because of the many Agave americana that was naturalised everywhere, it is obviously much cooler than most towns on the island and the dominant feature at the time was the almond blossom in pastel pink and white. There were also oranges and olives – in the foreground above. Almonds are an important crop on the island, although I suspect most is for local consumption, and almonds feature heavily in Spanish and Canarian sweets and desserts. These hardy trees need a cool winter to form flower buds and it is notable that you pass through different vegetation types as you climb the mountains and when you leave the bananas far below you the oranges get fewer the almonds start. On Tenerife, at this level, the sweet chestnuts start too but I didn’t see any here – though that doesn’t mean there are none! It was strange to see such a familiar hardy tree growing cheek-by-jowel with opuntia cacti and agaves. It would have been nice to see them in the sun against the blue sky we left in the previous valley but somehow it seemed appropriate to see such gentle and pastel flowers against a misty, grey sky and it was a total contrast to the vibrancy of the flowers on the coast.